You see, late last year, Holy Spirit led me to finish the writing I had begun with Him years earlier on the topic of His true justice over our self-justification. This writing is the final chapter in our forthcoming book, Enduring Grace. Studying holy scripture and receiving revelation for this topic over the years proved deeply transforming to me. I believe that when God desires to transform nations, He begins in the hearts of His people. I knew God would instruct me to share this “justice” message in His appointed time. And I knew God was speaking to me through this Justice Bible, so undeniably in my face. 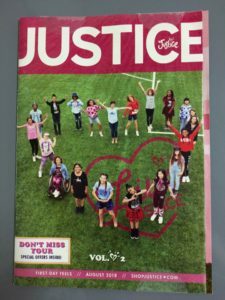 Later, at home, as I immediately prepared to get this message out, I received a second affirmation through a Justice clothing catalog for girls in the mail. Now, this is not a mailing list to which I have ever subscribed. I work diligently to keep junk mail from my mailbox. But this was no junk! I knew in my spirit it was God’s time to share our writings on this topic; because when God offers affirmations twice, “the matter has been firmly decided by God, and God will do it soon” (Gen 41:32). Oh, the establishment of two witnesses (2 Cor 13:1)! 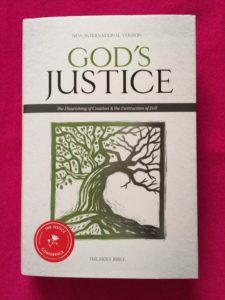 I hope this message on God’s true justice will prove powerfully transforming in your life, too. By the way, The Lord led me to find the children’s book I initially went to the store to buy. It was one aisle over from the Justice Bible. Don’t you love how He orders our steps and fulfills the promises He deposits in our hearts? !